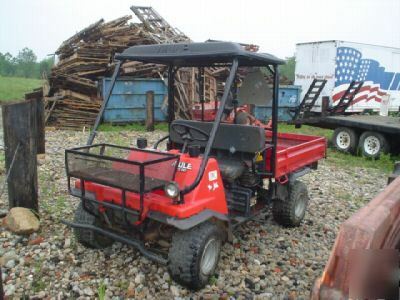 Used Kawasaki Mule utility vehicle with 617cc 20hp liquid-cooled kawasaki engine and CVT transmission. Has manual dump bed ,4wd, front carrying rack, and plastic roof. Cam was just replaced, rest of the engine was checked and is in good shape. Overall unit looks to be in good operating condition. Any questions please contact Tom Martin at .